Tag Archive | "amd kabini"
AMD Kabini: On-Par Performance, Good Efficiency, Great Competition. 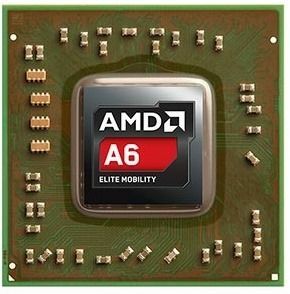 AMD Kabini, based on the new Jaguar Cores, is aimed at the ultrabook-alternative segment. 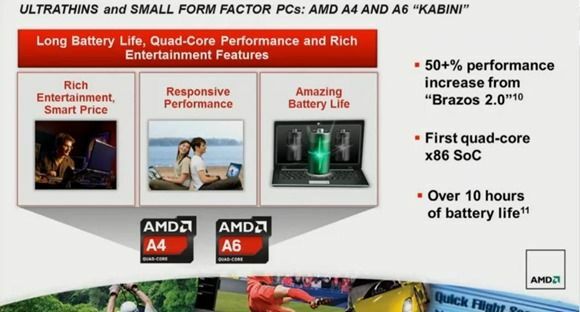 Specifically the A4-5000 and A6-5200 are the quad-core parts at 15W and 25W TDP that will compete against Ivy Bridge and Haswell based Ultrabooks and ‘pro-sumer’ tablets in 2013 and 2014. We’re expecting clock-for-clock performance with the quad-core Kabini platforms on par with (dual core) Ivy Bridge Ultrabook platforms but with a slightly better power utilization figure, especially when when the GPU is under load. However, remember that the A4-5000 is running at 1.5Ghz with no Turbo boost. Real-world performance on that part won’t be up to what we see on Ultrabooks that can sustain 2.4Ghz. Will the A6-5200 be better positioned with 2.0Ghz clock?